We are pleased to meet today to participate in and contribute to the reconstruction of Iraq, the fraternal state of Kuwait; I do appreciate the wide participation of countries and friendly organizations from different countries all over the World. We also extend our thanks to the international community for its confidence in the Iraqi government, which is embodied in this mobilization and the great support of the countries and major companies in the World participating in the reconstruction of Iraq. We have taken over the responsibility of running the Iraqi government under very difficult conditions, at Daesh's terrorist organization was occupying one third of the territory of Iraq, Millions of our people have been displaced, infrastructure and economic and service facilities have been destroyed in an unprecedented way in the history of Iraq or the region for decades. This was accompanied by a major financial challenge: the significant drop in oil prices to low levels despite the increasing need to spend on sustaining the battle against Daesh. But we did determine to face the challenge of eradicating terrorism, defying the financial crisis, fighting corruption and the bureaucracy that is hiding behind it, making economic reform, simplifying procedures and setting up a supreme investment committee headed by the prime minister with a follow-up team in order to pave the way in front of Investment and Rebuilding. The courage of our heroic forces and the steadfastness of our people, their unity and their cohesion with the State companies have played a decisive role in the victory over Daesh and graving of its sick dreams, the al-Marjieiat's , "religious authority", demand has a proven role in mobilizing citizens and volunteering in defense of their homeland, supporting of our heroic forces of all kinds. The tenth of December of 2017, it is the time of declaring the final victory to liberate our pure land; we have to mention the friendly countries that stood with us in our war against the oppressor. The war has ended the battle of Building and Reconstruction has started. Our material losses are large and require huge amounts of money, but the victory is achieved by what is more precious than all of this ... by the sacrifices of thousands of our finest sons who have been blessed with their innocent blood, the land of Iraq, as well as the wounded and the disabled. They have liberated our land, but at the same time they have saved the World from Daesh's danger, and they have stepped on its criminal schemes in terror, murder, and destruction throughout the globe. Today, Iraq stands a strong unified victorious, but stands on the ruins of massive destruction left by terrorist gangs, not only the infrastructure and economic facilities But included the housing sector, which Daesh's terrorist gangs did destroy so badly, its hatred reached the homes of people safe, At least 150 thousand housing units have been destroyed, in whole or in part, which requires us to give this priority with the support of the international community to repatriate IDP's. Looking for Stability to accomplish, preventing any other terrorist groups to appear. What we would like to emphasize on is that Iraq has the qualifications to advance with the blessing of Allah in natural resources and huge human potentials and specialized in all fields of work, creativity and supported the skillful. With the help and support of friends and brothers, we can mobilize efforts and get benefit from the investment and legislative environment to implement economic, service projects in liberated governorates and other governorates, where development opportunities have been severely hampered. Among of these is Basra Governorate, which is distinguished by its vital location and its position in development planning program to contribute to creating jobs opportunities, improving their standard of living, enhancing security, economic and social stability. We confirm the ability of our country to attract capital and companies from outside Iraq and inside to start a new phase of Reconstruction. A stage based on investing the country's potential, human and natural resources, And compensate for what Iraq did miss the opportunities over the decades of the time when the regime ignited wars with neighboring countries, It did lead to the imposition of a comprehensive blockade on Iraq, which that lasted for many years and widened the gap in what the country should have reached. In this context, we have undertaken major reforms to promote the economic and encourage the investment, including the partnership between the public and the private sectors. 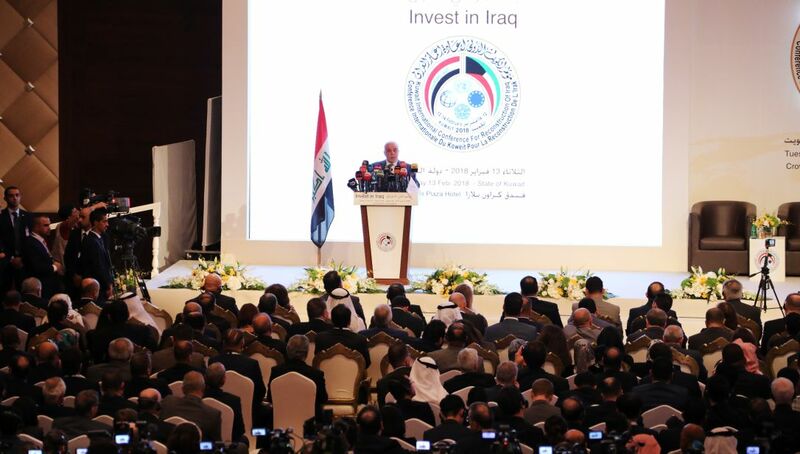 The Cabinet did issue a series of important decisions to address the problems and obstacles that may hinder or delay the procedures of investment activity, during the past two days, representatives of the Iraqi government have referred to part of these decisions and procedures, which facilitated the work of investors and the private sector. We have made sure that this conference is a real platform in which we present our plans and ambitions. Three main files have been prepared by the government and prepared by Iraqi experts and the World Bank: preparing the general framework for reconstruction and development; evaluating the devastation in the liberated areas; in the provinces of Iraq. We are therefore putting to the attention of interested donors or funded or investor databases based on a thorough objective extrapolation of the economic situation and service in Iraq. Despite the circumstances of the war that we have fought on and we have won by the sacrifices and courage of our heroic sons and the international support we have received, we have given the humanitarian side a great deal of attention and in every battle we fought in liberating the cities we have liberated the people before liberating the land. We are still working on this road to return the remaining displaced persons to their areas, especially when elections time is coming; we want all Iraqis to participate in order to select their representatives to promote the country. We have stressed on the need to take care of the groups in need of special care, especially women, children and the elderly. We continue to follow closely the fate of those who have lost or been displaced, urging organizations to support our efforts and to follow up the Daesh's terrorist gangs. We reaffirm our determination to continue the reconstruction and development in our country, looking forward to the world's standing with us to mitigate the effects of Daesh's criminals on the one hand and to achieve the common interests of our country, the countries of the World and the international organizations that renew our respect for all that it has provided and we are grateful for the high enthusiasm shown in Reconstruction of Iraq. In the conclusion, we reiterate our thanks and appreciation to the State of Kuwait, the Emir, the Government and the people, for their generous initiative in responding to this conference. We look forward to building the best fraternal relations between our two peoples and our countries having good relations with all countries of the world. I thank the ministers of countries and companies for their participation and their interest in Iraq, just as the Iraqis won the war, they will win in the Reconstruction.